If organization was an art, accountants would surely be the Picassos of paperwork (or the Renoirs of reconciliation). 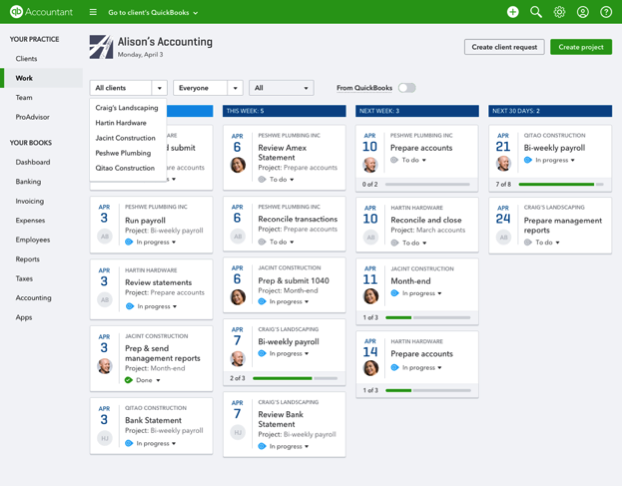 You’ve probably developed a unique system in order to manage the tasks, deadlines, and documents associated with each client. 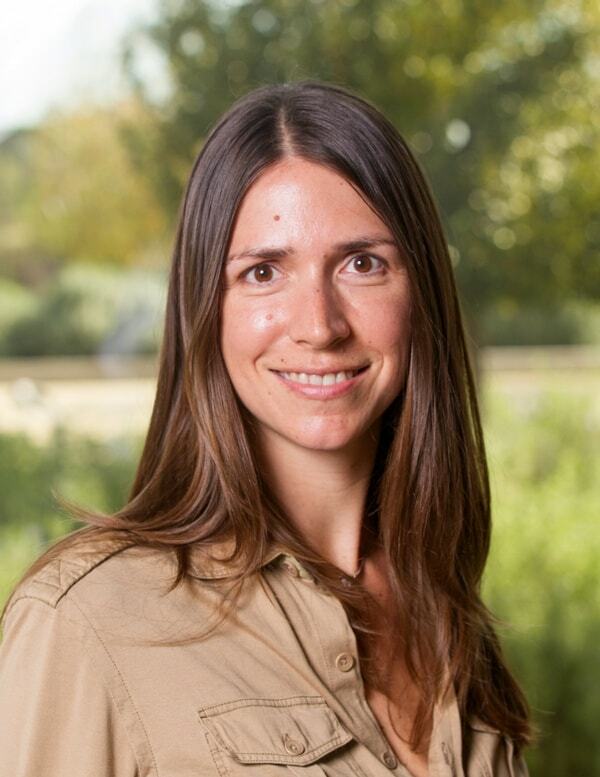 You’ve turned staying on top of things into a science. But using multiple tools to track your work can be overwhelming, and there’s always that nagging fear that something will fall through the cracks. Fellow to-do list lovers, rejoice! 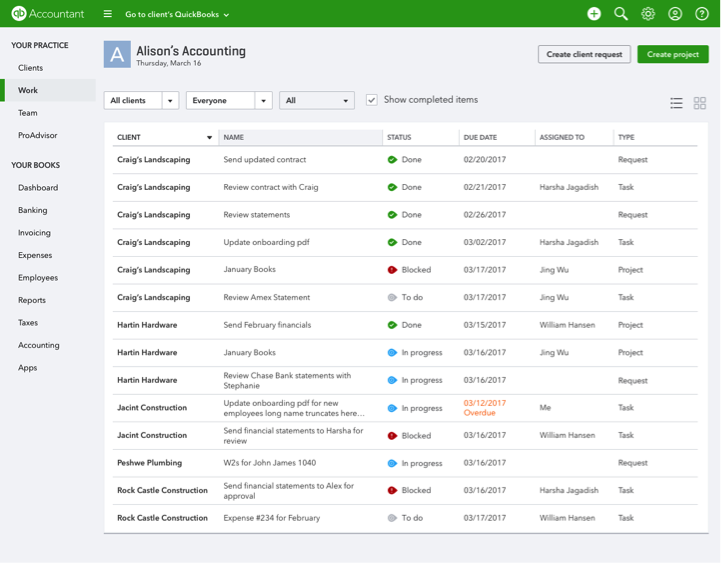 QuickBooks® Online Accountant team is excited to announce the launch of several free integrated practice management features that will help you manage your workflow and streamline client communication securely, right from the new “Work” place. 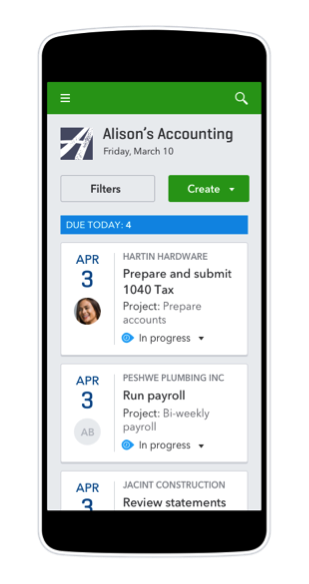 These new features mark the start of an end-to-end practice management solution designed with you in mind—this is just the beginning! 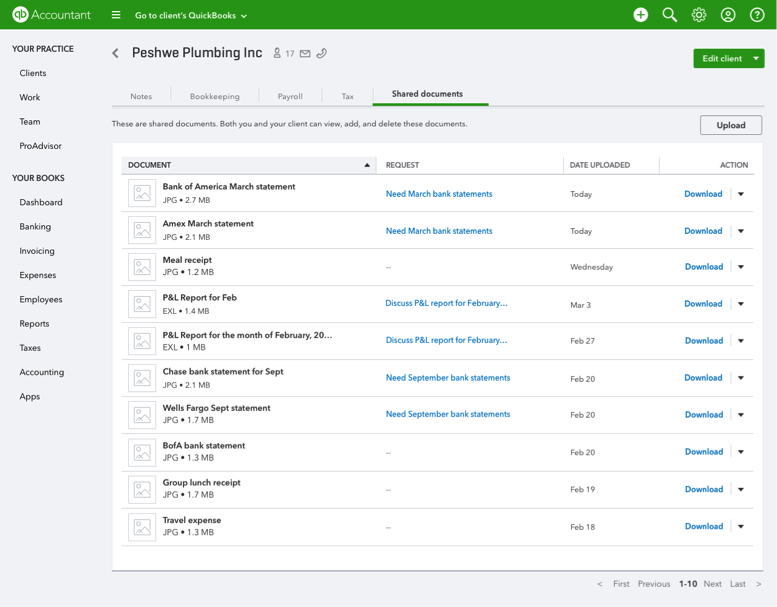 You can take a quick video tour of practice management below, or read on to learn more about the features and their benefits. 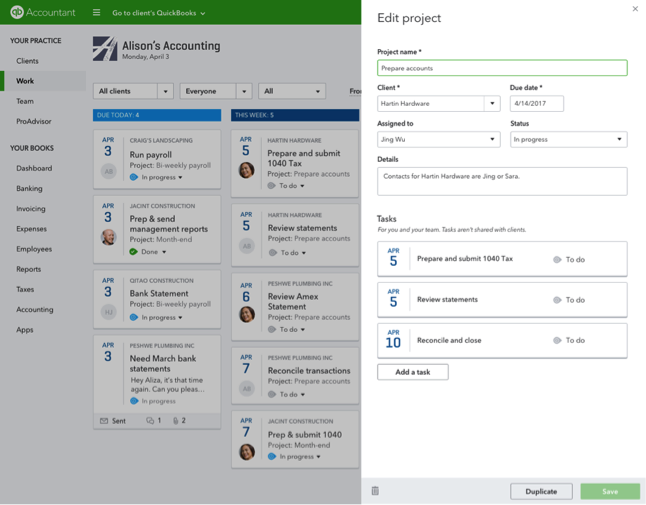 Create and assign projects and tasks to your team members right from within QBOA. Duplicate existing projects across all of your clients and make quick edits as needed, or duplicate a project for the same client that will occur on a regular basis. (The ability to create recurring projects is coming soon)! Check the status of projects and tasks in real time. 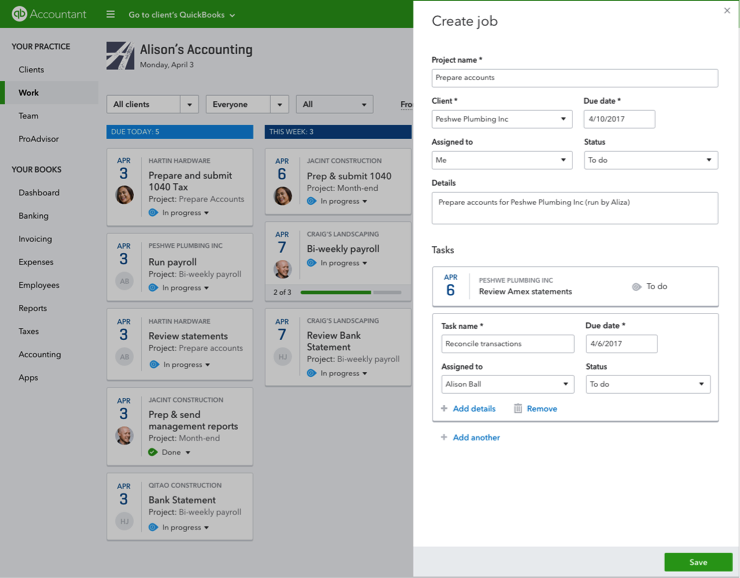 Sorting by client or team member makes it easy to track progress. List view allows you to see upcoming projects over 30 days out, along with completed projects. Send messages and share important documents to clients securely, directly within QBOA. 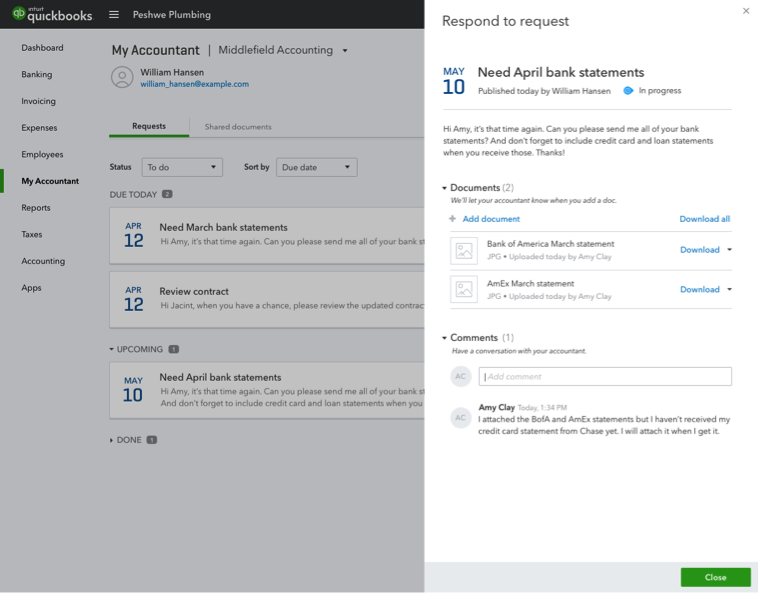 All of your requests live in your client’s “My Accountant” tab in their QuickBooks Online account. They can easily track the due dates of your requests, so they won’t miss a thing and you’ll get what you need on time. 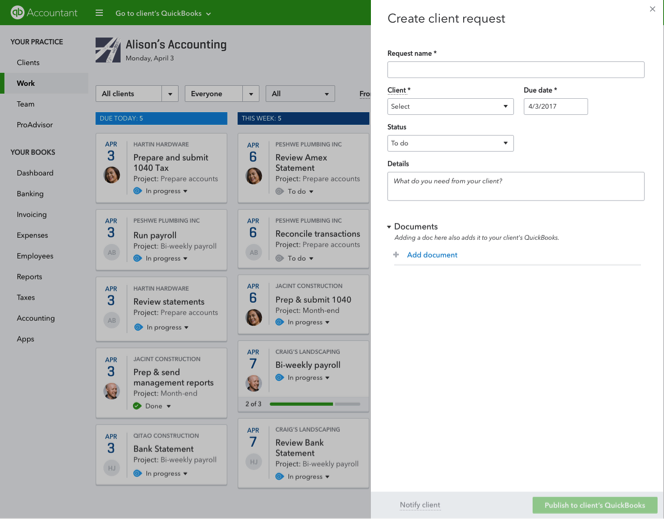 Your client can respond to your requests and share documents securely inside QuickBooks. Rest easy knowing your sensitive information is safe. You can track the status of document requests and messages at a glance within your dashboard. One central QBOA client list provides easy access to all shared documents, in each of your client’s details. Whether you’re at your client’s business or standing in line for a latte, you can track and update your work anytime, anywhere. We’re just getting started. 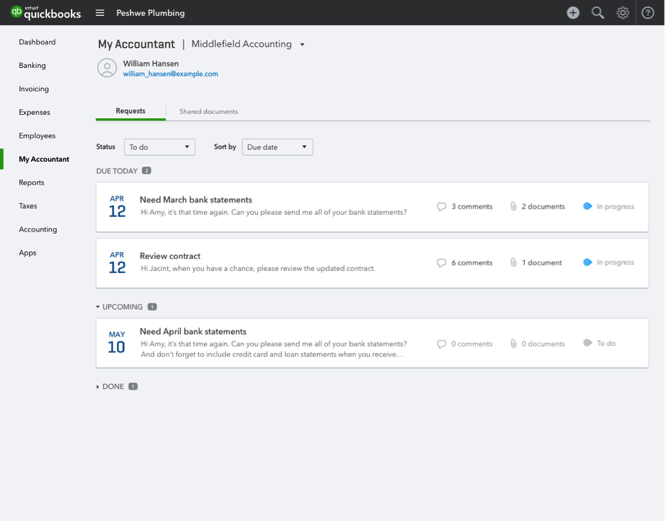 Our QuickBooks Online Accountant team is dedicated to providing accountant partners like you with a fully integrated, end-to-end practice management solution that will allow you to manage all clients across all services (including accounting, bookkeeping, and tax) from directly within QBOA. We’re so excited about this first step toward our long-term vision, and we hope you are too. Keep an eye out for more new features and benefits soon!